Congrats, your business is in the top 10% of all business in terms of size! However, if your business growth is dependent on your involvement in the day to day operations you cannot grow . . . because they are not making more of you anytime soon. We build systems that provide you higher productivity, less demands on YOUR time, and tangible improvements that grow your sales and profits. Yes, you can move from having a job and enjoying life as a business owner! Your business is a vehicle to take you from where you are to where you want to be financially, mentally, and emotionally. We build scalable systems and processes which allow you to work ON your business instead of just IN your business. Here is the “tell-all” question: What would happen if you left your business for a week? Two weeks? With our proven and customizable systems that we will help you create and implement, you will experience incredible benefits and an increase in your businesses scalability, your time freedom, and much more. when you sign up for a business growth assessment. While conducting a 5-day Business Growth Intensive, I met a very bright and capable business owner. He had some successes in the past but was clearly not happy with his current results. The last five years saw no growth in his business and the economy had just bottomed with little hope for the future . . . especially in his industry. Many of his competitors had shut their doors and gone out of business. His business was teetering on the brink of disaster. I became his business coach Tulsa and began the business consulting process. We worked together constructing a compelling business plan. Instead of losing his business, we made plans to grow it – even in the tough economic times he was facing. Enthused with a clear action plan for the next 90 days, he invested in my ongoing Accelerated Growth Coaching Program to help him implement the plan. We spoke, texted, and emailed frequently as we hammered through each of the action items . . . but to my surprise, the business showed no positive results even after 3 months of work. As a Tulsa business coach, I was concerned. We planned the work and started to work the plan . . . or so I thought. After an intense business coaching session, we discovered that he had been infected with the first costly mistake smart people make that stops growth. His heart was nowhere to be found! He was going through the motions but his heart and head were not engaged in the growth process. We had tough challenges to address and solve that required him to play full on to turn the negative tide in his business. I have been the business coach Tulsa for hundreds of businesses and this is one of the most frequent challenges I find. 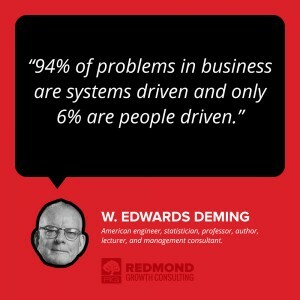 Business consulting becomes very effective when we can identify the problem and really solve it. After growing multi-million dollar businesses and consulting countless other businesses, I have discovered one truth that is essential for growth . . .
No heart, no growth. What was his challenge? He had developed a severe case of boredomitis. After working his business for years, he was bored with it and his heart was distracted chasing a number of “promising opportunities” everywhere except right under his nose. You will catch boredomitis. Boredom is the arch enemy of your To succeed in your business, it requires that you persistently create value, improve systems and get rid of ineffective actions that work against you. When you get bored and your creativity shuts down, you begin to see problems as problems, not as amazing As a result, you turn away from the very growth opportunities that are right under your nose. There is HUGE growth potential in your core business RIGHT NOW! As this business owner awoke from the paralyzing slumber of boredom towards his business and engaged his heart, things immediately began to change. Using simple yet strategically crafted steps that we outlined in the last business consulting meeting when effective business coaching transacted . . . and doing it with all of his heart (which doesn’t mean all of his time – it just means that when he was working, he did so with focused purpose), he reversed the negative trend that continued during our first three months in our coaching relationship. In the fourth month, he DOUBLED his business over what he had done in the same month the previous year. Every month, the business grew. Every month, we discussed what was working and what wasn’t then made changes. Business consulting proved itself to be his answer. He opened his heart to allow me to help keep him focused and accountable. He ended the year, which had started so poorly, with almost 50% growth over the previous year. The next year we continued to work together and he doubled his business! He achieved this while the economy continued to head downward. It is amazing what can be accomplished when you play with all of your heart engaged! How would you evaluate how much of your heart you have engaged in your business right now? If you could reach a goal in your business that would completely excite you to fully engage your heart into your work, what would that goal be? If you fully engaged your heart and excitement for your work, what ideas and opportunities come to mind that you have not acted on that would help you reach the goal you outlined in the previous question? This article was written by Tim Redmond, Tulsa business consulting specialist who has a passion for business coaching Tulsa.